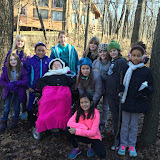 Ally had the MOST INCREDIBLE experience this past weekend with her Girl Scout Troop!!!! This is Ally’s first year in Scouts and her troop leader and new “sisters” have been absolutely AMAZING!!! This past Friday night till Saturday afternoon, Ally attended an indoor camp sleepover with a Detective/Investigations theme. She was with her fourth grade Juniors troop from Coonley, a few girls from a 6th-8th grade troop from her school and another 4th grade troop from Darien, IL. Camp Green Wood is in Woodridge, IL (less than an hour away without traffic) and was accessible. I was a little nervous and very excited about this new adventure for Ally and with the help of Nurse Dee Dee and how nice and accepting everyone was, it turned out PHENOMENAL!!! Since the weather was so warm, we even got to go on a hike through the woods in the morning. At camp, they allowed me a little time to talk about how Ally is in MANY ways a typical fourth grader with the same interests/likes/dislikes as most girls. We also talked about how each of us is unique and how Ally is unique due to her extreme muscle weakness, but her brain and heart are strong. We briefly discussed her trach, breathing machines/treatments, ways she gets food through a stomach tube, the importance of coming near her to talk/play since she can’t easily move towards others without someone’s help…. We knew this discussion was extra important since the girls would be spending more time with Ally than a typical school day and Ally would need her routine breathing treatments during camp. The girls had some excellent questions that Ally and I were happy to answer. They also got really good at asking Ally yes/no questions so that Ally could answer with her eye movement. We were super happy that the girls even hung out with Ally while she was having her evening and morning breathing treatments (like it was nothing – with just a few more small questions). I think she got the MOST FRIENDSHIP bracelets than anyone!!! We hope you enjoy the pictures from camp! Be sure to click on the album to see all of them….